These really ARE great veggie burgers! This recipe is one of the most popular FoodGeek posts I’ve ever made, and with good reason, these burgers are excellent. It always surprises me that a simple veggie burger can trump such things as macarons and the multitude of pastries on this website. For all the fans of the original recipe, here’s another look at the best.veggie.burgers.ever. The first time I made these burgers I wasn’t sure what to expect. Oats and nuts with a little bit of spice and some eggs just doesn’t sound like much of a burger to me. Believe me when I say this, I was very wrong. 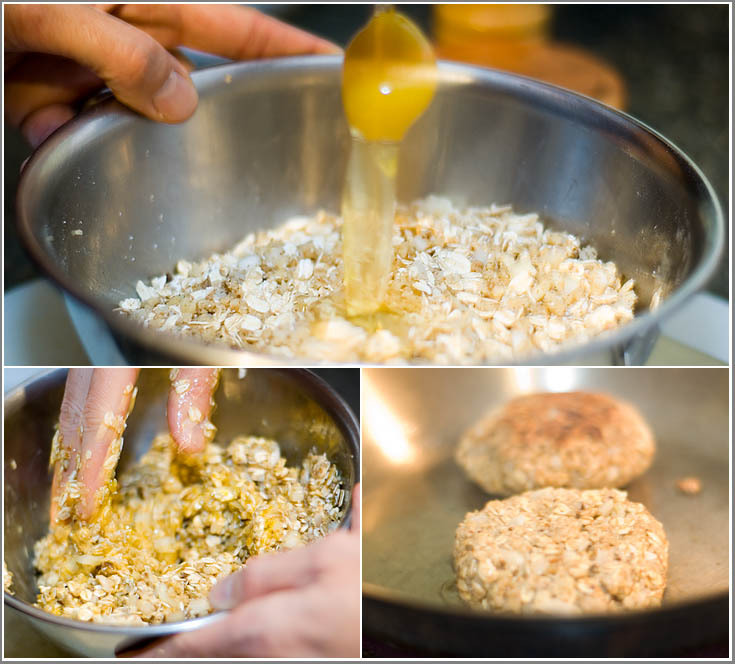 The combination of oats and nuts, first fried, and then boiled, make one of the meatiest, non-meaty burger you will ever have. There were many questions last time around, hopefully this post will answer all the questions. First off, here’s the recipe. Brown patties on both sides in a lightly oiled skillet, then pour the stock into the skillet and bring to a boil. Reduce heat and simmer, covered, for 15 minutes. Compared to the old recipe, I’ve made a few changes and was able to get the same results. This time around I skipped the breadcrumbs and the milk; I didn’t realize it until after I cooked them, but they came out great as well. I also settled on two cups of walnuts instead of a “cook’s choice” sort of recipe. I left out the sage, too, since you can take it or leave it. I left it out and they were still fantastic. I figure if there’s a spice you want in your burgers, you’re going to add it in anyways. Feel free to add whatever you’d like here; I think I used oregano this time and it worked nicely. The recipe suggests first browning the patties on both sides and then simmering in veggie stock for another fifteen minutes. This is not a mistake and really does work. The burgers will hold shape and do not get soggy, wet, or fall apart. A few readers mentioned they just fried them and it worked well, too. I fried a bit by itself without steaming and I can confirm it works; the texture is slightly less meaty, but in a pinch it works like a charm. I’ve yet to try a vegan version of this recipe but I believe you can substitue silken tofu for the eggs. It should work as a binder and have the added bonus of extra protein in the burger. 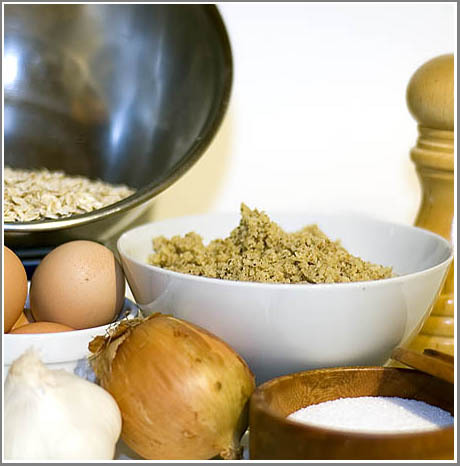 You’ll have to change the name to Super-protein Walnut Oatmeal burgers though. Has anyone else made these burgers? Have any suggestions? I’d love to see what everyone is doing with these burgers. Maybe we should have a veggie burger cook-off? Oh by the way since I am vegetarian I substituted the eggs with a product called Egg Replacer by Ener G. Also I used Almond milk instead of cow milk. All turned out very well. Yummy! If you dont like the cost of Ener G then boil flaxseeds in water allow to congeal works great and is cheap. Hello, I consider myself the veggie burger connoisseur but I have to say this burger has moved into my number one spot for the best veggie burger I have ever had! What sets it apart is simmering the burger in broth after browning it in the skillet. Reminded me so much of the hamburgers my Mom use to make when I was a child. My meating eating flesh burger loving girlfriend tried it and vowed she would never eat another “real hamburger” again. She loved it!!!!!!!!!!! Thank you so much for this recipe. It will be a staple in my home. Thank you so much, I love to read about other vegetarians and vegans as it gives me the strength to continue. I have about a thousand vegetarian feeds in my google reader, but I’m sure another can’t hurt!! I did manage to find a good lentil recipes here, but I’ll be sure to try yours too. Thanks! I tried these tonight using silken tofu as a binder. I used varying ratios, but sadly I had to return to using eggs for the remaining mixture. I had to be very gentle when flipping them during the frying stage to prevent them falling apart. By the end of the simmering process, the bubbles had eaten away at the patties almost entirely and I had a soup with floating oats in it. I think that because the simmering process is unusually harsh on the patties, a very strong binder has to be used – stronger than silken tofu at any rate. I halved the mixture because I was a little skeptical at how a burger made entirely of oats would turn out. But it works! They are delicious and chewy. About a teaspoon of spice per (full) mixture gives the patty a nice subtle flavouring (I used sage). You may want to put a bit more in if you’re after overtly flavoured patties, but not too much. Quick, easy and cheap! One for the recipe collection for sure.